Recently approved by the FDA, the ORBERA® intragastric balloon is a non-surgically-inserted device used to manage hunger and promote weight loss in individuals with a BMI between 30 and 40 who have been unable to lose weight through diet and exercise alone. ORBERA® intra-gastric balloon is saline filled, inflatable device placed inside the stomach by endoscopy to manage hunger and induce weight loss. There are no incisions or surgery on the stomach. It is placed during an outpatient procedure and patients go home the same day. It is removed 6 months later by endoscopy. How Does an Intragastric Balloon Work? An intragastric balloon device is made of silicone and filled with saline. The balloon works by taking up space in the stomach, thereby reducing hunger. Using an endoscope (a thin tube with a light on the end), a doctor inserts the gastric balloon into the patient’s stomach and inflates the balloon with saline. This procedure is minimally invasive, with no incision or surgery required. The patient is merely placed under mild sedation during the endoscopic procedure, and can go home within a few hours of the procedure. The inflated intragastric balloon takes up space in the patient’s stomach, promoting a feeling of fullness, reducing hunger and leading to weightloss. The intragastric balloon system is intended to be temporary, with removal required after six months. The removal process is as non-invasive as the insertion process, with your doctor removing the gastric balloon through an endoscopic procedure. Who Can Benefit From an Intragastric Balloon? Besides the weight loss benefits, gastric balloon patients in Fort Worth, TX can also benefit from a reduced risk of sleep apnea, diabetes, high blood pressure, heart disease and other risks associated with obesity. In short, the intragastric balloon is an excellent option for those patients who have not been helped by diet, exercise or medication alone but who are not comfortable with more invasive weight loss surgery options, such as sleeve gastrectomy or gastric bypass. What is the recovery process from intragastric balloon insertion? The procedure to insert the intragastric balloon lasts only 30 minutes, with patients able to go home the same day–many after just a couple of hours. Recovery from gastric balloon insertion is generally very easy. Patients are required to stick to a liquid diet for approximately two weeks, and are back on a diet of normal food by three weeks after having the gastric balloon inserted. As there is no invasive surgery, there are none of the complications involved with traditional weight loss surgery. Intragastric balloon patients are intended to participate in a diet and exercise plan designed and monitored by their doctor and nutritionist. Bagshahi Bariatric and General Surgery are pleased to offer their patients this new treatment of gastric balloon surgery in Fort Worth, TX. Finding a safe, effective weight loss solution can be challenging, and with many options to choose from, it’s often tough to make a decision. One non-invasive, effective weight loss option is the intragastric balloon, which is an inflatable device that is filled with saline after being place into the stomach. It’s designed to aid in weight loss by managing hunger. If you’re unsure whether this is the best weight loss option for you in Fort Worth, TX, here’s a closer look at the pros, cons, and potential risks that come with choosing a gastric balloon surgery for weight loss. Minimally Invasive– Since the balloon is inserted through an endoscopic procedure, there’s no need to worry about an incision. The procedure is quick and safe, and you’ll go home the same day. No Changes to the Stomach or GI Tract– Some surgical interventions for weight loss result in changes to the stomach or gastrointestinal tract. The balloon does not result in any changes to the anatomy of your stomach or GI tract. Less Expensive– Because it’s minimally invasive, it means that the procedure is much cheaper than other weight loss surgeries available in Fort Worth, TX. Improved Health– The drastic weight loss that comes with the use of the intragastric balloon result in other health benefits, including lower blood pressure, lower risk of diabetes, reduced levels of cholesterol, and fewer problems with fertility issues. Develop Good Habits– The balloon is left in the stomach for several months, and you’ll have the chance to learn good eating habits, such as eating smaller portion sizes. This helps with long term weight loss maintenance in the future. 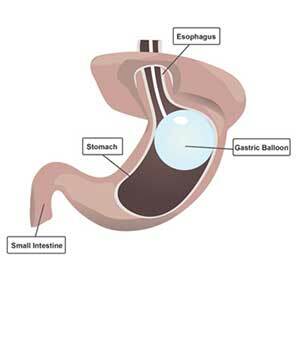 Temporary Procedure– The balloon or balloons cannot be left in the stomach indefinitely. They must be removed, and after balloon removal, you must continue to use healthy eating habits and exercise to maintain weight loss. Discomfort and Nausea May Occur– In some people, discomfort and nausea from the balloons may occur, and nausea is particularly common if you overeat. With dietary training and the use of medications, these hurdles can usually be overcome. Diet and Exercise is Essential– While the balloons help keep you feeling full, you still must focus on diet and exercise to enjoy optimum weight loss. Most patients never experience any complications with the intragastric balloon procedure. However, it’s important to be aware of the potential risks. During balloon insertion and removal, perforation or bleeding can occur in rare cases. For the first few days after balloon placement, some people may experience nausea, vomiting, and gastric discomfort, although this rarely lasts long term. Extremely rare risks are deflation or leakage of the balloon. You can also talk to your Fort Worth, TX physician about the potential risks of this weight loss procedure. It’s also important to note that the gastric balloon is a procedure that is approved by the FDA within the United States. It’s been approved as an effective, safe procedure for significant weight loss. Diet is a critical part of any weight loss plan, including those that utilized a surgical solution. The Gastric Balloon procedure inserts a saline filled balloon into your stomach, so you eat less. It is a very minimally invasive and temporary surgery done using an endoscope. The goal is to fill a percentage of your stomach, so you eat less naturally. This is a practical choice for the healthy Fort Worth, TX patient with a BMI of 30 to 40 that is struggling to lose weight quickly. The balloon stays in for about six months and then the doctor removes the intragastric balloon. During those six months, you will need to follow a very structured eating plan to manage your post-surgical diet. If you are considering this effective surgical weight loss option, you need to know more about the Gastric Balloon diet. Start with around 100 ml portions about six times a day. You can gradually increase the portion to 200 ml as you start to feel better. Nausea comes from air in your stomach, so be sure to drink slowly and try not to talk during your meals. Between your liquid meals, you will want to take small sips of coffee, water, tea, broth, or vegetable juice. This will ensure you get enough fluids. For lunch and dinner, you can have a weight-loss shake or even a yogurt drink. Keep the portion size to 100 to 200 ml. and between meals continue drinking small sips of liquids. You can add a low-calorie hot chocolate or a thin malted drink as snacks, too. After about 11 days, you will start eating solid foods. You’ll need to keep the portions small and chew your food well. The doctor may advise you to take a multivitamin during this time to supplement your nutrition.